If you're like me and haven't really started Christmas shopping and you haven't got a clue as to what to buy, then perhaps we might have a solution for you. 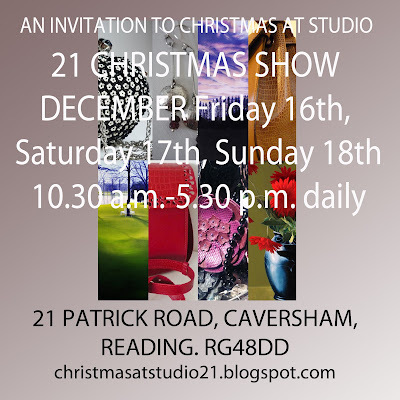 Handbags, purses, brooches, all hand made in leather; paintings, prints, and cards, many of local scenes; jewellery: Silver, acrylic, and combinations, necklaces, earrings,pendants in a range of styles and designs, all made here at Studio 21. We are open from 10.30am - 5.30pm Saturday and Sunday the last weekend before CHRISTMAS!